Editor’s Note: I redacted a phone number out of respect for the individual’s privacy. A man called me this morning 01/31/08 because he thought I was Lee and posted the video. He started making accusations against me. He called from [Redacted for privacy purposes: Let this also be a lesson to anyone who wants to call for the sole purpose of screaming at somebody…… they call it caller ID for a reason] and asked for me by name. He then proceeded to act like he was a person with high authority acting on behalf of PCLinuxOS which he later told me was not the case. I’m not going to release the information in the phone call yet because my PR team is working on peacing all of this evidence together to form another story. Although I would like to thank all of the trolls that have contributed to the evidence so far. I encourage you to please keep sending your submissions and harassment so we can document it and use it to further solve this mystery. I e-mailed Lee and let him know about this man. That is probably why he removed his video. I can’t say that I see the discrimination being targeted directly towards the disabled since I can’t see the discriminating Posts on the video but I do recognize those user names. It’s not really all about PCLinuxOS. These Trolls are trying to infiltrate everywhere and break us up. They are looking for any little thing and trying to magnify it by either taking it out of context or blowing it up out of proportion or by trying to get statements out of people like my by saying mean and hurtful remarks that are just ludicrous. The Federation of the Tollerant and Moral Free. Then he sent me an e-mail saying that he was for Morals? If you ever asked yourself how Hitler got the Germans to go along with his plans read the book “The Wave“. It’s a true story about how a History teacher got his High School students to transform into Mindless Followers without even trying. It got so bad that the entire town, and the school stepped in and asked the History Teacher how he was going to turn it around. It’s very easy to start a revolution driven by fear. Now I don’t want to be racist against any Linux distributions but I want to state some facts. These Ubuntu LoCos are very exclusive to anyone thinking that any other distro could be as good and Ubuntu. They Discriminate against any other distro. They believe they will become the supreme Linux Distro and wipe out all others. All of their followers may not know this or believe it but most of them do. I know this because of e-mails I have received from them. I already stated this in another blog post. PCLinuxOS and some other distros are headed in the same direction. I don’t believe that this spirit is being driven by people that started the projects but rather by these cults or representatives from these cults. It may even be funded by Microsoft. New evidence suggests that PCLinuxOS is based off of mandriva but that they are still guilty of doing the same things that they accused me of. I will confirm all the data before posting a response to this. So are you for or against exclusion, devision, and discrimination or do you want to keep feeding the trolls. Yesterday one of these anonymous trolls found that I was against SUSE, Xandros, and Linspire because they sold out to Microsoft. They tried to lead me on by saying that they agreed that SUSE, Xandros, and Linspire were evil and they added that I should be against any distro that was being maid outside the USA just to try to lead me into a trap. I’ve still been getting these posts in my forums. I immediately delete them and some times post a response. So you see it’s not me Discriminating against anyone. It’s just a band if Internet Trolls banding together to divide and destroy the Linux community. Don’t feed the trolls or they will bite off your hand. Now part of freedom of Religion and freedom of speech is the right to stand up for what we believe. If I’m a Christian and I believe that Christianity is the only way to Heaven as all true Christians believe then I’m entitled to that belief. I don’t come out and say to a person “You are going to Hell” or “You are damed” and I can’t do that because that’s also a part of Christianity. Only God can say who is damed and who is not. I know what the criteria is for going to Heaven and Hell but only God knows for sure who is and isn’t. The thief on the cross that died next to Jesus went to heaven in his last hour because of his faith. Also I may not believe that being Gay, Bi, or Lesbian is not right but I’m not going to condemn anyone for being that way. Also you seem to think that Christians Discriminate people. Watch This and This and then you tell me that Christians Discriminate. If you want a real life example when I was in High School there was a Gay kid that everyone knew. He was very exclusive and didn’t want to be friends with me. I kept my distance from him and didn’t say hurtful remarks or racist remarks to him. One day he tried to privoke a fight by saying that my mother was on Crack when I was born. So I replied and said that his Mom was watching too much Martha Stewart while he was born. All I was doing was standing up for myself. The teacher didn’t even seem to care because of how stupid the other kid was for trying to start something when there was peace. I will tolerate any Race and try to learn as much about them as I can. Now I’m not racist. I will talk to anyone who is willing to listen or talk back. 🙂 Peace man. Now I think I’ve been as open and honest as you could ask so LAY OFF! For those reading the last post, it was indeed a very good discussion. Let us not end such a thing with the ending of that post. Let us continue with a new post. There is a need for myself to clarify a few things, and in doing so, I hope that all readers will learn more about both themselves and the person that I am. I am not a Christian. I stopped following that path (never really followed it) during the eighth grade. I kept it inside of myself until I blurted it out in the middle of social studies. We were debating how best to counter Saddam Hussein, a dictator. Being the foolish idealist at the time, I figured that convincing the people to rebel against their leader would work (just take a few aside, and plant ideas in their minds and hearts). Then he did. The teacher said, “Let us stop thinking like Christians for a moment…” I at that point was no longer a Christian. I blurted that out, and….. well…. The school I went to was in a town with multiple churches. You can guess how my fellow classmates took it: not very well. One told me that it meant I had no soul. Others tried to “save” me. I countered the question about believing in God with, “Do you believe in yourself?” A teacher misinterpreted it as me asking if the person believes they have the power of God. Thinking back, I now find such a thing quite amusing. What was meant by that question of mine was the matter of self-reliance. Are you going to use your faith as a crutch in life, or are you going to finish that prayer at last and do something yourself to change the situation you are in? The whole non-Christian thing started off on an amusing note. We were discussing the U.S. Constitution in the seventh grade. We were going to be tested on it, and would have to pass it (mandatory in other words). We noted that the President, when elected, would often place their hand on the Bible as they were being sworn in. We asked what would happen if the President in question was not a Christian. I figured, “Why not find out…..” I figured that as President, I would simply follow the tradition, not out of agreement, but out of respect for it. I of course no longer have any aspirations for the Oval Office, especially since I now understand how the responsibility for any government can not be placed upon the shoulders of one official alone. I sympathize with those outside of Christianity. I truly do. I know how Wiccans are often discriminated against. I have heard stories of lesbians getting beat up. I know how horrible such things are. However, I also see a precedent emerging that is quite dangerous. In the beginning, Christianity, before it obtained the official title (right when it was hijacked by the Roman Empire), was discriminated against by religious leaders who felt their power base being threatened. It then eventually obtained dominance and became corrupt in a sense as those claiming to be a large part of that group started imposing their doctrine on everyone else. There were factional splits due to those with slightly more courage, such as Martin Luther, who did not like what he saw with the Catholic Church, and never intended to break away from them (it simply happened as a result of leadership feeling threatened…. after all, they wanted control). There are individual Christians who are quite close minded. I also recognize however that there are those who have very open minds as well. Here is where I see the problem: points of view being crammed down other peoples’ throats in the name of tolerance. If we as a society can not convince people on our own that being respectful of others’ beliefs and values is a good idea, then we as a society have problems and will eventually fail as a society. We should not resort to laws forcing ideals down the throats of others. Like Jesse Ventura, I agree that morality can not be legislated. Why? We all have morals: they just do not match with every individual. The link in the last paragraph may appear bigoted at first glance, but think about it for a moment. A business may refuse to hire somebody based on a Christian perspective, yet Christian churches have to hire those who are not Christian? Wait a minute? Is that not a double standard? As someone who is not Christian, I would not want to work at a church as I have no intention on joining the faith, which is the only reason one would want to go to one on a regular basis. I understand why the proverbial boot of a non-Christian is being thrust upon Christians: out of fear that they may lose ground in the fight for their rights. However, take note: I am not for Wiccan rights. I am not for gay/lesbian rights or womens’ rights. I am for everybody’s rights! I find things being done to those outside of a rigid Christian perspective to be horrible. What worries me is that those fighting against bigotry are becoming bigots themselves against Christianity in general and jumping to conclusions that are quite dangerous in the long run. Allow me to explain…. Justin Breithaupt is a good friend of mine. I once asked him, “You do realize I’m not a Christian, right?” He says, “Oh yeah…” and moves on. What? No comment on how I shall burn in Hell? Nothing saying I am evil for not believing what he does? Take note that I am not an atheist either. I consider myself mostly neutral, but if I had to pick a side, I would choose Discordianism. I may not be as devout as I would like to be since I do not eat a hot dog every Friday, but I would proudly declare myself one of the few, the proud, the chaotic at the same time. The point is, we are both able to work together somehow. Did he discriminate against me as a non-Christian when I inquired about a notebook computer with set budget (it was fairly high)? Did he screw me? He runs a business called Computer Rescue. Through that business, he has migrated people away from Microsoft-based solutions. He used PCLinuxOS to do this as he found it to be the best at the time. He attempted to communicate with their forum in the past, and was attacked due to openly being a Christian, and having said content on his website, despite the fact that it was his site, not theirs. I suggested earlier that Breithaupt’s business be added to their list of OEM companies, but found out later that said post was deleted. He was not the only person attacked due to a “social issue.” Take a look at this video, and you might see what I mean. How did you like that? That did not seem very nice, did it? I became so concerned, that I came very, very close, to asking the PCLOS group if they were going to do the same thing to Justin that they did to Lewis. I will not specify what I meant by that. Those on the developer mailing list of that distribution will more than likely know what I am referring to. Anyway, this shall conclude this post. Let the discussion continue. Well… sort of. It shall be ambiguous to a degree for a good reason. We all have issues with other people from time to time. It is bound to occur sooner or later. This is simply some brain food of sorts. That is all this post will consist of. So allow me to give all the readers of this blog some insight. Not being Christian does not automatically make you better than a Christian: We all have different belief systems in this world. Even atheism is a belief system (one that excludes the belief in the existence of any deity). However, it is important to note that you are no better if you spend all your time trying to convince a Christian that they are mentally ill. Perhaps they are being too hyper about a project they are working on. Or perhaps they are overly honest about what they believe. The more you learn about someone else’s philosophy in life, the more you learn about yourself, which brings us to the next point. Nobody is better than anybody else, no matter what: I could be in the same room as George Soros. Soros would not be better than I am, nor would I be better than him. He has more wealth than I do, but in the end we are both human. We are both living beings capable of verbal dialog, thought, and emotion. Spelling and grammar does not make a person evil: Having unwritten rules concerning grammar and whatnot is very harmful to any group of people. After all, what if a person constantly making type-ohs is dyslexic? I have English grammar (American version anyway) mostly correct because I choose to do so. It is not perfect, nor will it ever be perfect. However, I do have a warning to grammar nazis out there: If you want to criticize my writing, feel free to waste your time. If it is a mere suggestion however, I will hear you out. Making everybody happy all the time is hopeless: It will never happen. Instead, focus on the ones you are making happy, and figure out how to keep them happy. Ultumix 0.0.1.3 and beyond. What’s new? The question that is on everyone’s mind is What will Ultumix 0.0.1.3 have over the buggy 0.0.1.2 and the impressive 0.0.1.1? Well thats a 3 part question because there will be 3 editions in the end. First of all we will have Ultumix Light. It’s the most stable version and the fastest. Based on Mint XFCE 4.0 it runs very fast, has tons of hardware support, supports dial up a lot better than 0.0.1.2 and 0.0.1.1, and it has a very nice Windows User friendly interface. It has a few programs on the desktop. Not as many as in the other versions. 0.0.1.3 should be able to fit on the Eee PC. I would recommend replacing the 4 GB memory module with an 8 GB memory module. It just makes more sense. You should also buy an external DVD drive. We also want to add a nice video editor. If it works out we may even put some Linux programs directly onto a CD or DVD so that you can pop the disk in your Eee PC and play the game or open the program installed on it without compiling first. In future versions of Ultumix we plan to release our OS compiled for the PS2, PS3, Wii, Nintendo DS, iPhone, XBOX 360, XBOX, and other future Game Consoles. Maybe we could even find a way to hack that mysterious TiVo? Ultumix 0.0.1.3 is comming soon to a Desktop near you! LOOK OUT! 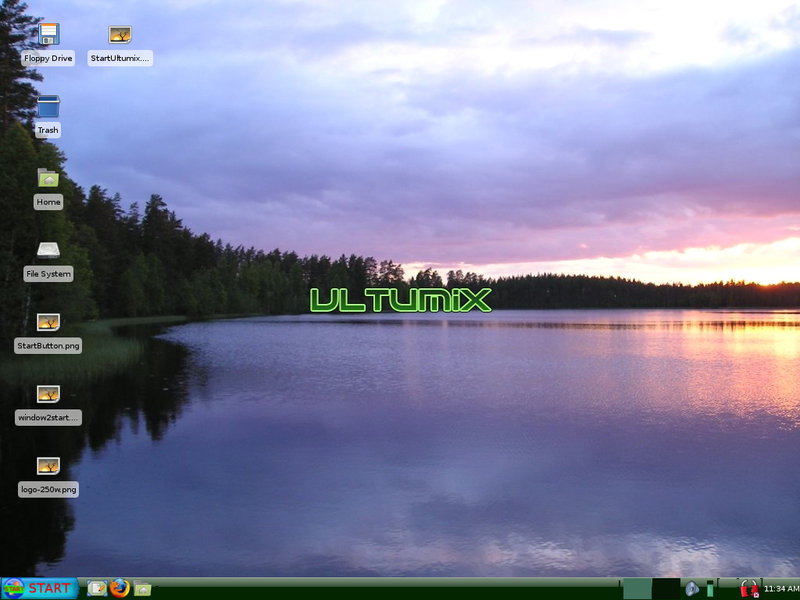 Ultumix is running faster than ever thanks to the new XFCE interface. It’s running so fast with such a small RAM requirement that It does not even slow my PC down when I start it up in a Virtual Machine. But thats not what makes Ultumix 0.0.1.3 so cool. I found a Start Button on the internet that looked very similar to the XP start button. It looked so similar that I decided it needed some tweaking first. Basically it’s like an ICE version of the XP start menu button if there is such a thing. It’s a cool blue button with START in Big Red Letters across it. No more excuses to not use this OS. Now there is one thing or make that two things that are driving me crazy. First of all I can’t edit the start menu the way I’d like too because it’s not KDE. The editor only lets me have some abilities. 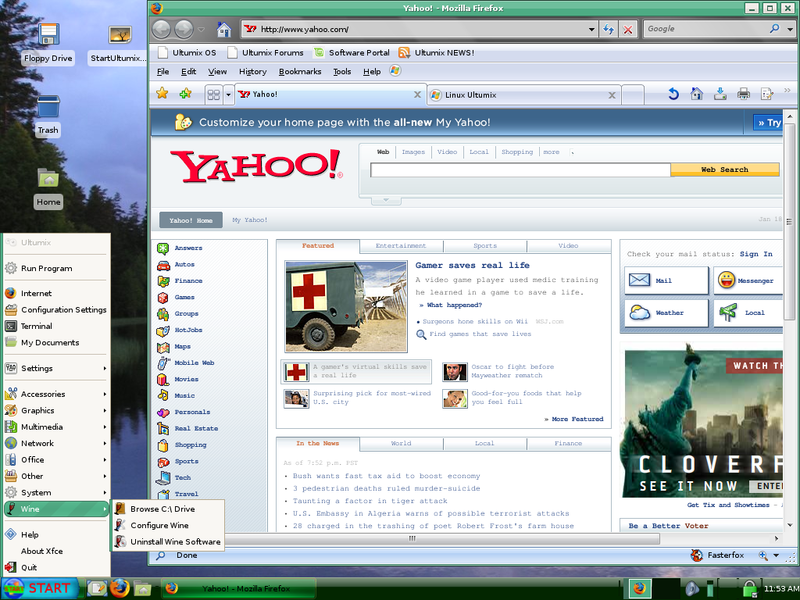 The second thing is that I can’t just right click on the icons in the menu and add them to the desktop. However in XFCE there are no monitor resolution problems. This is a very good Plus. In order to add the applications to the desktop I will need to write down the commands used to open each one. It also appears the link to writer is broken in the menu. It opens office but it does not open a document. There is a lot of work to be done yet to make it more Windows user friendly but I’m getting there. The hardest thing yet may be to edit the GRUB and boot splash. Yes. 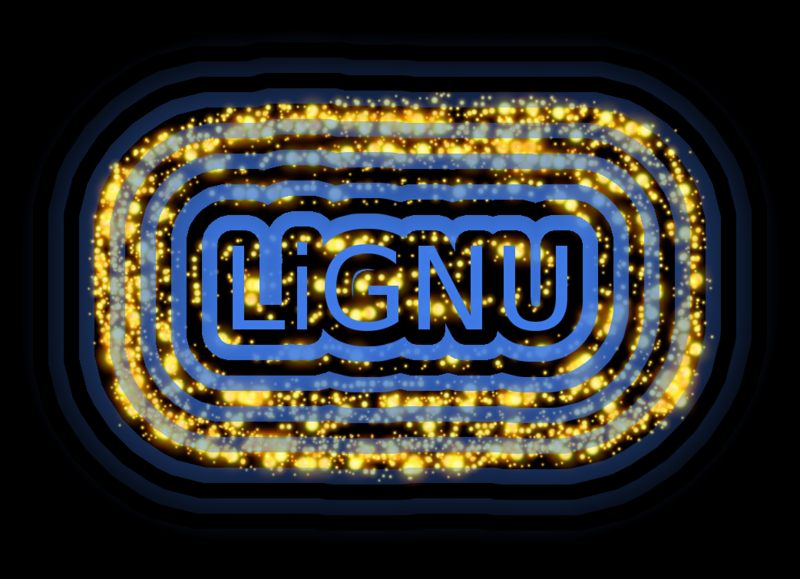 I figured I’d go ahead and use GIMP to make a rudimentary wallpaper. For those who could care less about digging, here’s a link to the original LJ post. We all forget things from time to time. It happens to the best of us and the worst of us. I have forgotten many things in the past several months (and some may never forgive me, but that’s life attempting to teach me a few lessons), but the one important thing that I have forgotten the most as we are now in the New Year is to give credit where credit is due. Last year was the beginning of a few interesting things for me. One of them was the initiation of the Tux500 Project, an attempt to have Tux plastered on an Indy500 car. Bob was the guy who started the effort to raise enough money to have that logo on a race car for millions of fans watching at the track or on television and listening on the radio. The negative backlash is not what is important at this point. What was important was the fact that were it not for me going through every *nix distribution on DistroWatch in an attempt to communicate with the webmasters and/or developers on those sites, I never would have stumbled upon the NimbleX site, and I never would have met Bogdan, the main developer of such an interesting distribution. I also would not have learned the hard way that not everyone appreciates PDF attachments in their e-mail. I was able to connect to more people because of it. Thanks goes to Bob Moore for such an inspiring idea. The CEO of ZaReason is destroying stereotypes with every passing day. Contrary to what some may believe, women can work with technology, and as far as I am concerned, more women need to be in technology. Many of them are able to take note of even the slightest detail. She loves the idea of sharing software with the world and allowing others to contribute to such a positive undertaking. Thank you Cathy for all that you do and continue to do. Also, thanks so much for taking time out of your busy day so that I could interview you. The experience was quite wonderful and enlightening. When it came to off the wall accusations against you, I was quite surprised. You see, I know of the concept of friends over the web, but how many of them are in regular contact on the phone? Not very many. You and helios have not allowed other forms of conflict to hamper your friendship, and that is a trait I truly admire. When it came to a fellow FOSS enthusiast being accused of wrong-doing, you were fair about the whole ordeal and did not allow bias to skew your judgment. That is quite commendable. Were it not for your blog entry on changing an entire company over to a *nix platform in defiance of the Business Software Alliance, I never would have encountered you. I was doing a story on the dark side of Microsoft when I stumbled upon that entry. I was reading, and was quite interested. You are one of the few people in life who has shown a great amount of patience, and I am one of the most annoying people on the face of the planet. Thanks so much for not screaming at me ever and for being such a powerful comrade in the fight for software freedom. There is quite a ways to go yet, but were it not for efforts such as yours, we would not be in the position we are in right now.